ANNOUNCING A NEW WoW FEATURE! 2012 Cava Mestres Brut Nature ‘Coquet’ Gran Reserva, Catalunya: We heard about this fine decades old producer while traveling in Spain years ago. Our friend said they made wines that were as close to real champagne in style and quality, yet still uniquely Spanish Cava, as could be found in Spain. We are happy they are here in WA, and this is a beauty- no dosage, very dry. With nearly four years aging on the yeast lees, it has fine biscuit-brioche aromas, tiny bubbles and crisp appley flavors with solid weight. This is a gastronomic, high class sparkling wine which would likely cost 3 times as much if it were from Champagne! 2017 Quady North ‘Pistoleta’, White Rhone Blend, Rogue Valley, OR: Herb Quady came up from California in 2003, escaping from the heat of the Central Valley where his father, Andy, makes some of America’s fortified wines and vermouth. Herb became entranced with gorgeous valleys, peaks and Mediterranean climate of the Rogue Valley, especially the Applegate Valley west of Medford. 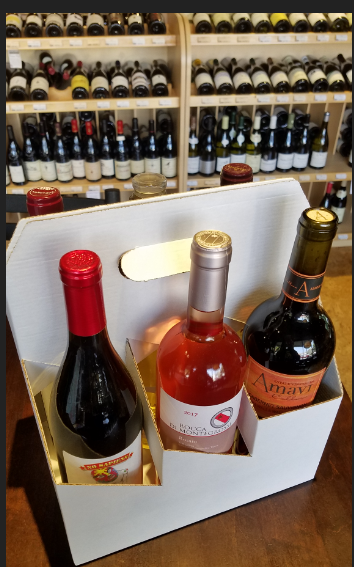 Herb was convinced that the region, reminding him of Southern France with its warm days puctuuated by afternoon winds and cool nights, allowed Rhone varieties to thrive. The Rhone and Spanish varieties prosper in the mix of marine sedimentary and rocky-clay soils of the area. Making a name for himself has been a challenge in this ‘other’ Oregon-- Pinot Noir is not the name of the game down here, though he makes a pretty good one! This is such a delicious blend of 42% Viognier, 23% Roussanne, 29% Marsanne, 5% Grenache Blanc & 2% Vermentino! The grapes were all co-fermented harmonizing the flavors, and partially barrel fermented in Acacia wood and French oak barrels, yielding this expressive, lush wine. Lots of fruit! Ripe peach, some honeysuckle and bright fruit aromas. Fairly crisp and fresh, but also rich, with a creamy texture provided by the wood aging. Neat, intense palate, but bracingly fresh and distinctive flavors. 2016 Delas Cotes du Rhone Saint Esprit: Delas is one of the top four great wine merchant/growers of the Rhone Valley, along with Guigal, Jaboulet and Chapoutier, founded in 1835. The current Technical Director/winemaker, Jacques Granges came on board over 20 years ago, and since then, the quality of Delas’ wines has soared to new heights. WoW carries their top Hermitage wines, which are superb, and priced accordingly. Yet it is this unique Cotes du Rhone that recently grabbed our attention; high quality, low price. Saint-Esprit is made from a blend of syrah (majority) and grenache grapes, which come from a small village in the Ardèche region. The vineyard’s southern exposure on steep granite hillsides provides the best growing conditions for the vines. It is this more northerly origin and granitic soils that makes Saint Esprit differ from most wines of the appellation grown further south in warmer climes and on more sedimentary soils. Floral-blackberry, lightly gamy, syrah-influenced nose. Medium body, graceful flavors inflected by anise or graphite on finish. Mild tannins and bright fruit lead to a peppery, chewy finish. This is just so easy to drink and versatile at the table; one can even chill it for an hour to serve with lighter dishes. 2016 COR Cellars Momentum Red, Horse Heaven Hills: One of our favorite wineries located in the Gorgeous (!) Columbia Gorge, Momentum red is delicious rich blend of Petit Verdot 52%, Merlot 22%, Malbec 20%, and Cabernet Franc 6%, all from McKinley Springs and Alder Ridge vineyards. Dark violet ruby. Ten months aging in neutral French oak barrels frames this chewy wine, propelled by strong, currant/anise/graphite and black pepper aromas. Dense, dark blue/black fruit flavors, full body and a supple mid- palate richness leads to a ferrous accent on the long finish. Very good value, too! 2017 19 Crimes Shiraz, SE Australia: OK…gimmick? Or reaction to ‘critter’ wines from Oz? Or out-of-the-box approach highlighting Australia’s singular history? What is 19 Crimes? In England, there were 19 crimes for which a convicted person could be ‘transported’ to Australia. Thus, the people at Treasury came up with the idea of focusing on the fact that Australia was originally a penal colony. The marketing gurus found their hook and were then able to find real mug shots of criminals being sent to AustraliaHere’s the hook, according to writer Sharon Nagel in Vitisphere: “After the swell of Yellow Tail, Americans and for that matter Canadians thought of Australian wines as having an animal on the label and being cheap and cheerful. Looking at the different wineries owned by Treasury, there is one called Baileys of Glenrowan. It happens to be near the place where the famous bandit, Ned Kelly, had his last stand, [In 1880, when Kelly's attempt to derail and ambush a police train failed, he and his gang, dressed in armour, engaged in a final gun battle with the police at Glenrowan. Kelly, the only survivor, was severely wounded by police fire and captured. Despite thousands of supporters attending rallies and signing a petition for his reprieve, Kelly was tried, convicted and sentenced to death by hanging, which was carried out at the Old Melbourne Gaol. His last words were famously reported to have been, "Such is life”.-Wikipedia]. One thing is certain - this Shiraz is pretty tasty for the price. First made and imported in 2012 to Canada and now in the US, the wine shows a lot of intensity, ripe fruit flavors and suppleness for a modest price. 2016 G. Viberti Barbera d’Alba La Gemella $18.50: Deliciously vibrant dark red fruit flavors and soft tannins combined with fine acidity show classic Barbera character ideal for drinking with almost anything you choose to serve. La Gemella (the Twin) refers to Claudio Viberti’s mother Maria, who has an identical twin sister, and is a great lover of Barbera, Piedmont’s ‘everyday’ wine. 2016 Enrique Mendoza ‘La Tremenda’ Monastrell, Alicante, Spain $12.50: Tremendous, indeed! One of the best surprises I have tasted recently is this full flavored yet balanced Mourvedre (Monastrell in Spanish) from the Alicante appellation in SE Spain. Why is this wine so good? For one thing, it is grown at 2000’ elevation, so much cooler, slowing down maturation to allow for balanced alcohol, freshness and lots of vibrant fruit. Also, the vines are traditionally bush-trained, and over 30 years old requiring manual care. Most Monastrell wines from Spain in this area taste raisiny, a bit cooked and jammy; not to our taste. La Tremenda shows balance, fresh dark fig/plum and licorice flavors, with energy and fine tannins framing the deep fruit and good acidity moderating the ripeness. Sophisticated yet rustic, but above all satisfying. The Wine Advocate® gave it 92 points. I can only agree, especially for such a low price. 2017 Powers Chardonnay, Columbia Valley $12.25: Bill Powers and his family are turning out some of the best values in Washington wines these days, showing great improvement in the last couple of years. This fresh, lively, moderately rich and very easy drinking chardonnay won’t have you thinking of Montrachet any time soon, but then, it doesn’t cost $800 either. Ripe pure honey pear apple flavors, good weight and juicy finish. Still hankering for fresh cracked crab? Here’s your wine! 2015 Selvapiana Chianti Rùfina $17.50: Rùfina, east of Florence and cooler, is the other ‘great’ zone historically, for Chianti, and Selvapiana is the finest practitioner. Selvapiana in Medieval times was one of the watch towers along the river Sieve built with the purpose to protect the city of Florence on the North-East border. During Renaissance the building was enlarged and transformed into a Villa as summer residence of noble Florentine families and of the bishops of Florence. In 1827 it was acquired by Michele Giuntini, a successful banker and ancestor of Francesco Giuntini, the present owner and fifth generation to run the property from 1957 to 1997. There is probably no more satisfying red wine at the table than fine Chianti, due to Sangiovese’s dark cherry fruit, fine acidity, medium body and savory flavors. In a superbly ripe vintage like 2015, all this character comes forward in a most satisfying way. Mediu intense, dried cherry/light leathery-oak bouquet. On the palate, it is fairly rich, intense and balanced, with good weight and center. Ripe dark cherry-anise, lots of fruit and fine tannins holding it together. Nicely done and focused. 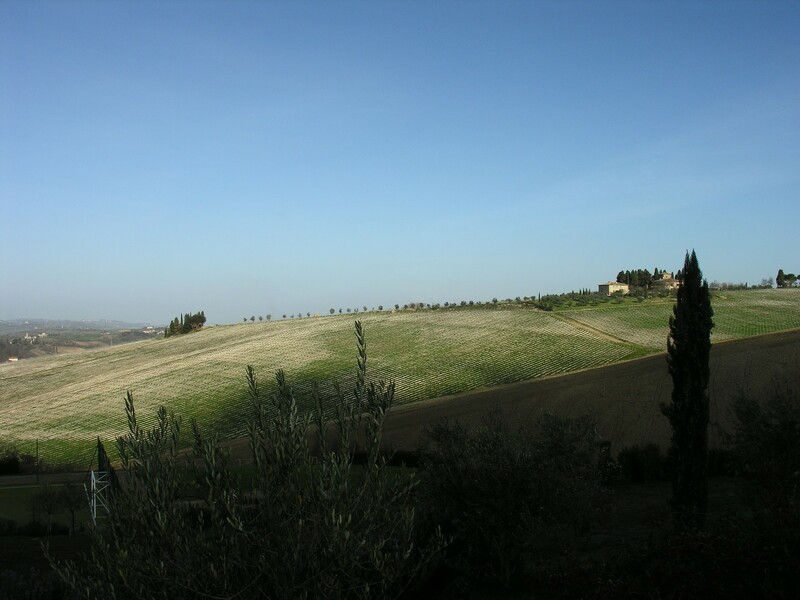 The epitome of class and Tuscan focus from one of the oldest and famous wine areas in Tuscany. 2015 Dominque Piron Beaujolais Villages $18.50: Here’s a seriously intense yet utterly delicious ‘drink-me’ wine from one of the best domaines in Beaujolais. 2015 was a powerful warm, ripe vintage yielding wines such as we haven’t seen since perhaps 2009. Dark ruby, Bright, deep black raspberry, even graphite or granite minerally aromas show the class of Gamay on granitic soils found in the best vineyards of the area. What sets this apart from the usual cherry/soda pop style of Beaujolais is that it has more ‘chew’ to it-solid grip and length. Good fruit. Serious style. Drink now for its ripeness or wait 2-3 years when it will soften further. Either way, a perfect wine for Fall’s cooler days. Easily one of the best Cab Franc based wines I have tasted from the West Coast! 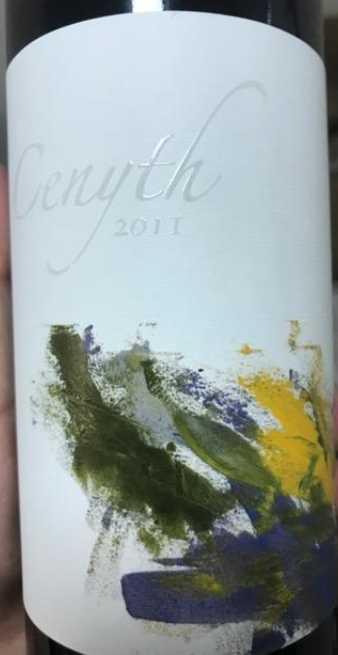 The name Cenyth represents Hélène Seillan beginning her journey as a winemaker, tutored by her Bordeaux trained renown father Pierre Seillan. Following in her father’s footsteps, Hélène pursued a career in winemaking and began splitting her time between Sonoma County and Saint-Émilion. Starting in 2006, she served as assistant winemaker for her father at the family’s Bordeaux estate. This is an admirably balanced, very Saint Emilion Grand Cru Classé like wine. Fine deep ruby, violet magenta. Superb, cassis, cedar graphite and berry nose. Aged in 40% new French oak barrels, the wine unfolds with a textured, dense, minerally palate and velvety but rich tannins. Nicely balanced. Very St Emilion length, focus. Can keep 4-6 years, but its mineral-graphite, dense yet fine textured flavors are good now with some aeration before serving. Lovely and fine California Bordeaux blend. The Original Super Tuscan, and one of Italy’s most consistently great wines. In 1970-71, Piero Antinori strayed outside the then current, restrictive production code for Chianti to make a wine truer to, and richer than that associated with what passed for quality wine in the 60’s. Using Cabernet to enrichen the austere Sangiovese, then aged in smaller French oak barrels, the result brought out the best of the Tignanello vineyard’s terroir. 2015 is a magnificent, deeply concentrated and elegant wine with more Sangiovese in the blend, due to greater ripeness. Widely acclaimed by all critics, this is a masterpiece, among the very best I have had going back to the original. Worth cellaring for 10-15 years if you can! 2017 Patricia Green Reserve Pinot Noir Willamette Valley $29.50: The passing of our friend Patty Green was a true shock to us. We miss a good friend with a wicked sense of humor and a commitment to making Pinot Noirs that truly expressed both their origin and Patty’s sense of what was right for that site. Her partner, Jim Anderson, continues to make wines which reflect their joint vision, guided by 20 years of partnership and shared sensibilities. Patty helped crush this 2017 Reserve Pinot Noir, their lovely, more affordable distillation of all of the vineyards they work with. It is archetypal Willamette Valley Pinot Noir. 2017 appears to be an excellent follow-on to the stellar 2015-2016 duo. You cannot go wrong with Patty Green wines, and this is no exception; succulent yet earthy, fine ripe fruit with acidity to match, frame, and focus the deliciously dark cherry, gamy flavors and soft tannins. As Patty used to say: ‘Women taste better’! And indeed, she had great taste –as does this wine. 2016 Saviah Cellars Walla Walla Syrah $31.50: Our friend Rich Funk makes some of the most flamboyant yet balanced wines in Washington, full of character, rich fruit and fine texture. The newest version of his Syrah, derived from Funk Estate, Watermill Estate, Anna Marie, and Lewis Vineyards. Aged for 17 months in 20% new French oak barrels, it perfectly expresses Walla Walla Syrah: Purple ruby. Ripe berry cassis aromas with wheaty, slightly smoky violet floral accents.. Very fat, rich, hint of licorice. Plush dark berry flavors, with supple tannins, olive tapenade and some charcoal notes. A great expression of WA Syrah capable of aging up to 6-8 years.